Yeah, Tracy has holidays and I have been able to spend some time in the studio painting! It's been great, though I'm quite rusty. Takes a long time to loosen up, but it's just great to be in the space and have uninterrupted hours to work, to think, to just sit and read. Luxurious that is when you have a 14 month old. 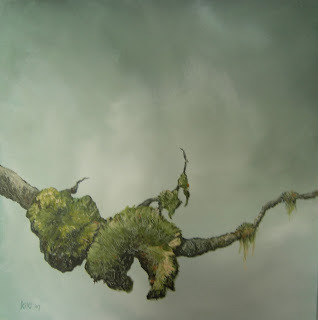 This is a work I created last year (not the greatest pic, sorry), but I have started a new work in a similar vein: branches with moss and lichen. Seems I'm inspired by my surroundings, hey? This will be my last post for quite a while. Tomorrow we're off to Mexico for sun, warmth and a different culture! We're very excited to go and explore sandy beaches, ancient cities, jungle and volcanoes. Will be back in February with some pictures! That is the most beautiful studio ever! i so want to see the inside - hopefully you can share some studio photos after the Mexico photos. Enjoy and soak up the warmth. 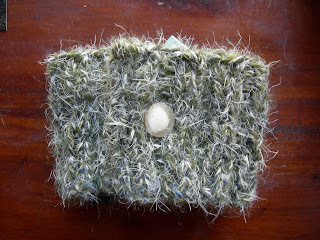 i also love the lichen work. Wow - I thought the branch was a photo! Unbelievable work... wow. Ella, just before I left I uploaded some studio pics on my flickr site to give you an impression.